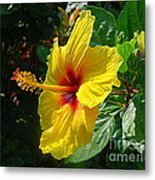 There are no comments for Sunshine Yellow Hibiscus With Red Throat. Click here to post the first comment. 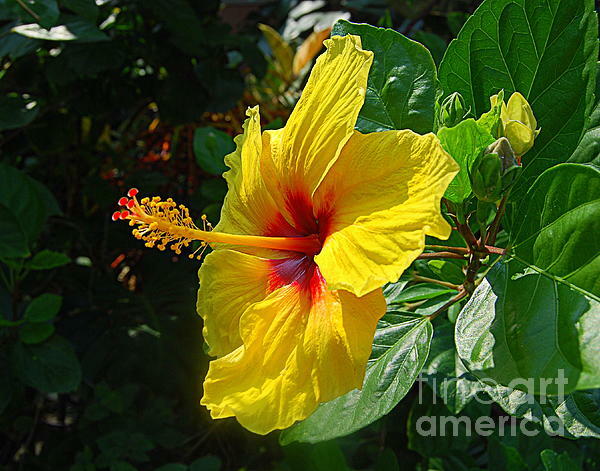 Hibiscus is a genus of flowering plants in the mallow family, Malvaceae. There are several hundred hibiscus species, which are native to warm-temperate, subtropical and tropical regions throughout the world. 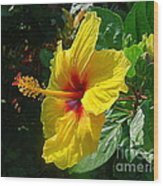 Member species are often noted for their showy flowers and are commonly known simply as hibiscus, or less widely known as rose mallow. The genus includes both annual and perennial herbaceous plants, as well as woody shrubs and small trees. 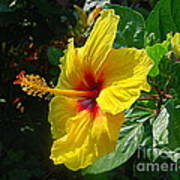 An all-yellow hibiscus, Hibiscus brackenridgei, is Hawaii's state flower.